Image caption William Armstrong: "We need to treat mental health on a parity with physical health"
Mental health services are being "starved of resources", the chairman of a health watchdog in Norfolk has said. 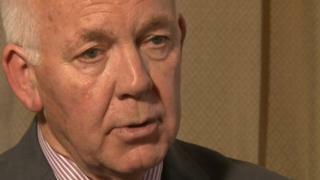 Ex-coroner William Armstrong, of Healthwatch Norfolk, said cuts meant "more misery" for patients and their families. He said he had seen a "fragmented and uncoordinated" approach to mental health during his time as a coroner. The government said it was working to ensure "equality" in funding of mental and physical health conditions. The commission said mental health currently receives 13% of NHS spend in England but accounts for 23% of demand. The annual budget for NHS England is about £100bn. Mr Armstrong, who was Norfolk coroner for 18 years, said he saw many inquests involving people with mental health conditions. In September 2013, he presided over an inquest into mental health patient Matthew Dunham, 25, who died at Castle Mall shopping centre in Norwich. The inquest was told Mr Dunham faced a month-long wait to see a specialist after describing suicidal thoughts. Mr Armstrong told BBC Look East: "Mental health services are being starved of resources given to other parts of the health system. We need to treat mental health on a parity with physical health. "We need to spend more money on mental health, that is unarguable. The government is beginning to recognise that." He said the lack of cash meant more people with mental health conditions would not be diagnosed, leading to "more misery for them and their families". Mr Armstrong said the number of people killing themselves when suffering from mental health conditions could be reduced with the "right specialised treatment by the right people". A spokesman for the Campaign to Save Mental Health Services in Norfolk and Suffolk said: "Mental health services have to be funded at a level which delivers a decent service to the most vulnerable and needy, young or old. This is not the case at the moment." The Department of Health said: "We are absolutely determined to make sure there is equality between mental and physical health. "That's why we have invested over £450m in improving access to psychological treatments." Michael Scott, chief executive of Norfolk and Suffolk NHS Foundation Trust, said: "We welcome William Armstrong' s comments and we're pleased to see a healthy level of debate about mental health and funding. "These are tough times for the public sector, and the NHS, and we believe that, at a national level, there needs to be greater focus on fairer funding for mental health services."